Earl Grey’s Irish Famine Orphans (49): a few Queensland orphan stories? This post needs your help. Are these families, orphan families? What do you think? Like some other orphans who went to Queensland, they did quite well for themselves. Readers, i hope, appreciate how much the reconstruction of the orphans’ lives, both in Australia and Ireland, is a cooperative effort. These examples draw attention to some of the pitfalls involved. I had hoped to include details about Margaret Hardgrave nee Blair per Earl Grey. But I seem to have lost the documentation that would confirm this particular individual was an Irish Famine orphan. My entry for her in Barefoot, and on the website, was that she was a sixteen year old Presbyterian from Ballymena, County Antrim who married a shoemaker, John Hardgrave in Brisbane, 29 July 1850. She died 1 August 1924 at the age of 92! I suppose that is possible. If this is correct, Margaret was one of the most materially better off orphans. Her husband’s estate was valued at £9450 at the beginning of the twentieth century, much of it suburban real estate in the West End of Brisbane. When she died at home in Petrie Terrace, the “Hardgrave Estate” was “situated on a fine rise of land, with a 260 foot frontage to the tramline at West End” and “comprises three substantial residences and two splendid building sites”. Here is an extract from John’s will and codicil, ‘signed sealed and delivered by Margaret Lydia Hardgrave in 1908’. Could someone please put my mind at rest; was she an Earl Grey Orphan? This Margaret Hardgrave was born in Antrim too. She spent one year in New South Wales and seventy-five in Queensland, at the time of her death. Her estate was valued at £2107.05.07. Here is another example that needs verifying, Bridget Muldoon per John Knox. Kerryn Townsend wrote to me from Ipswich in January 1994 but her letter and its enclosures did not come to me until much later. How I managed to neglect her interesting carefully researched material I just do not know. She even offered to send me a photograph of Bridget and her husband, an offer I obviously failed to take up. Is this one an Earl Grey orphan? Her death certificate says she was born in Enniskillen, County Fermanagh but the John Knox shipping list has her as coming from Drumkilla townland in County Cavan. The two are not so far from one another. Bridget was 91 when she died, but again that is not impossible. Kerryn was convinced she was an Irish orphan. Here is what she told me. Bridget’s husband, native born John Ingram had an Aboriginal mother called Maria. John was described as Aboriginal when he was baptised as a twenty year old in West Maitland, 15 October 1851. The couple had sixteen children, ten sons and six daughters (one not on the form below) three of them lost at a very young age. Like many of the orphans, Bridget and her family were geographically mobile. You may wish to use google earth to follow in their footsteps. They gradually moved north from the Hunter Valley in New South Wales via Myall Creek where John their third child was born, to St Clair, Falbrook, still in New South Wales, where Mary Anne was born. About 1863, Bridget and John and their six children moved to the Maryborough District of Queensland where they were to stay for the next fifteen years. Then about 1878, taking the younger children with them, they moved to Yeulba in the fertile Western Darling Downs where they were to remain for the rest of their lives. John died in 1892 and Bridget in 1925, aged 91 or 92, another long-lived orphan! Kerryn , are you out there somewhere? Did you confirm the names of Bridget Ingram’s parents were Patrick and Betty? What do readers think? Is this an Earl Grey orphan? Thankyou for replying Kerryn. Please see Kerryn’s comment at the bottom of this post. Here’s an illustration of how little time some of the orphans actually spent in an Irish Workhouse. 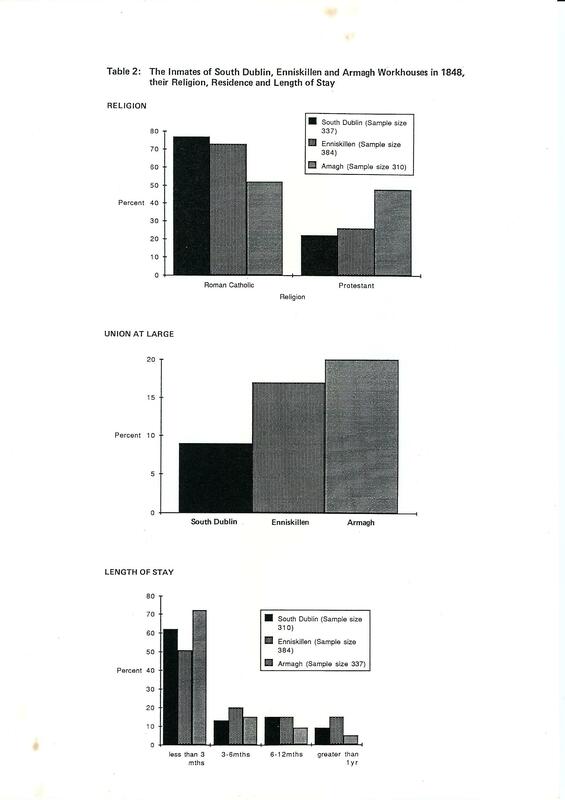 Note that less than twenty percent of inmates gave “Union at Large” as their place of residence. Bridget was very specific about her place of residence. These next two I’m fairly certain are Earl Grey orphans. But she married well, to William Darling in Brisbane, 20 May 1850. William was a canny Scot originally from Fifeshire. The family owned a farm on the banks of the Brisbane River, possibly employing Kanak labour. When she died in 1892 she left an estate valued at £3313.00. 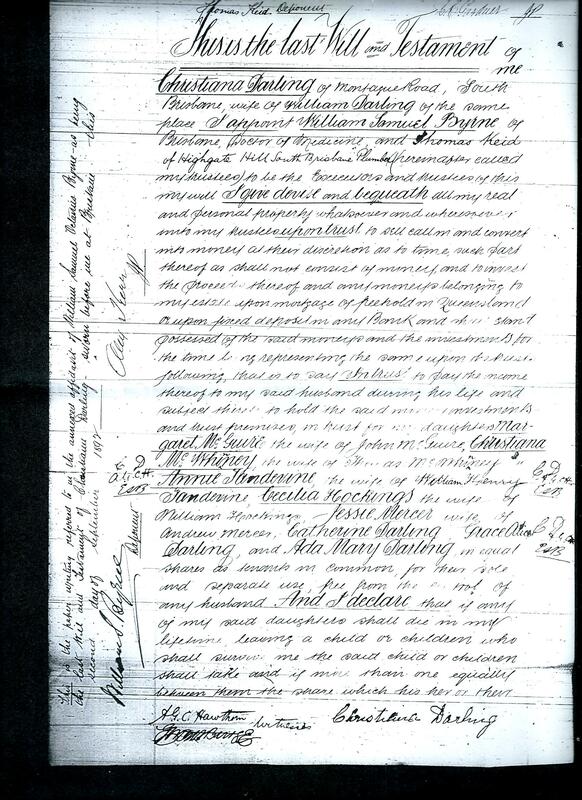 Here is part of her will which shows the names of some of her children and how careful she was with her money. Note the names of some of her married daughters, Margaret McGuire, Christiana McWhiney, Annie Tandevine(? ), Cecilia Hockings, and Jessie Mercer. 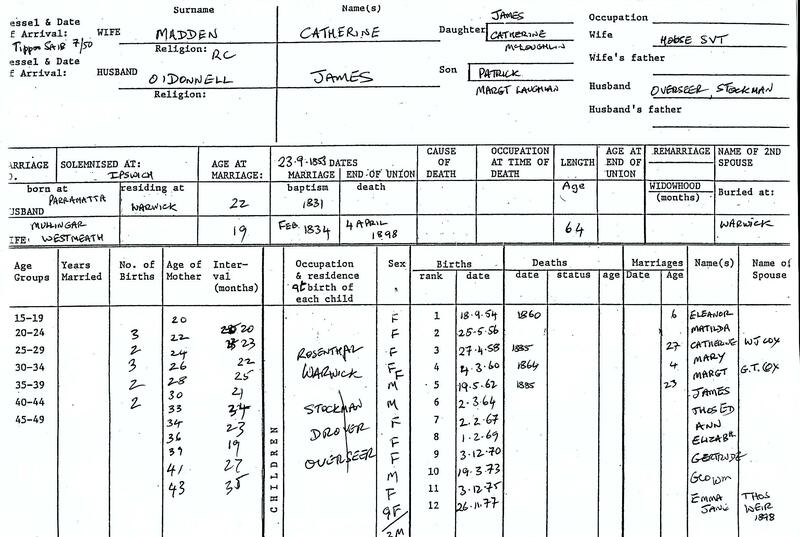 Information about Catherine Madden also came to me through correspondence with one of her descendants, in May 1991. Unfortunately I only have her first name, Jacqui. She was living in Windsor, Brisbane at the time. According to Immigration Correspondence in the State Records of NSW, she was sent to Moreton Bay, 2 September 1851. Two years later she married native born James O’Donnell in Ipswich (23 September 1853). James, son of a convict, worked on a property called Rosenthal near Warwick. It was there that most of their twelve children were born. Jacqui’s research showed there was often a gap of several months between the children’s date of birth and their baptism. Later in life Catherine bought land, and was licensee of a hotel in Warwick called Rose Inn. In her will she is described as a Boarding House keeper. Perhaps this is how she managed after her husband died? Catherine herself died 4 April 1898 of ‘Dengue fever, Cerebral Haemorrhage and convulsions’. Her son, twenty two year old, George, the sole beneficiary of her will, was the informant. He thought his mother was only 56. This entry was tagged Bridget Muldoon, Brisbane, Catherine Madden, Catherine O'Donnell, Cavan, Christiana Darling, Christiana Wynne, Digby, Drumkilla, Dublin workhouse, Earl Grey, Enniskillen, Enniskillen workhouse, family reconstitutions, James O'Donnell, John Hardgrave, John Ingram, John Knox, Kerryn Townsend, Margaret Blair, Maryborough, ship 'Earl Grey', ship Tippoo Saib, West End, Yeulba. Bookmark the permalink. Hi Shirley and Trevor – after further research it turned out that I was tracing the wrong Bridget Muldoon! My Bridget was not an Irish Famine orphan but accompanied her parents Thomas Muldoon and Jane Campbell and siblings Daniel, Robert and Mary on the voyage from Ireland to Australia aboard the ship “Adam Lodge”, arriving in Sydney on 13th July 1837. The other information I provided about Bridget and her husband John Ingram and their children is correct. Bridget may not have been a famine orphan but she did have a very sad childhood – her father was murdered in 1845 and her mother later found guilty of being an accessory after the fact and imprisoned in Parramatta jail. And a year before her father’s death, Bridget’s maternal grandfather Robert Campbell was also murdered. I think she was a remarkable person to overcome these tragedies, marry at sixteen, have sixteen children, find time to be the local midwife for the western Queensland town of Yuleba and surrounding areas, and live to the great age of 89. Do you have my research on Mary Taylor who arrived on the Tippoo Saib? She was born c1834 at Parsonstown (Birr) daughter of Edward and Catherine Taylor (both deceased)â¦ Her religion was noted as changed from Catholic to C of E during the voyage. Mary âAnnâ Taylor ended up at the Woolshed gold field in Beechworth and gave birth to Mary Ann Taylor in 1857 (unmarried) father Frank Bolton from America, Carrier, age 34â¦. She one previous child. I donât know if Mary Taylor married, where she died, a trove article was found where a Mary Ann Taylor was taken to court for neglecting her children. Witnesses said she was a good mother when she wasnât drinking, but on this occasion had been drinking for weeks and she received financial support from their father, who had gone to Otago (presumably seeking gold). So I only have the timeline history of her daughter Mary Ann Taylor. A George Wilde, Butcher may have taken care of the children as when Mary Ann later married and had children she always named her father as George Wylde. Mary Ann Taylor married Thomas Broxom in Mudgee NSW and had five children including my grandmother Sarah Elizabeth Broxom born 1890 at Fitzroy St, Dubbo NSW (only a few minutes away from where my mother died in 2007. My mother never knew her mother as Sarah died when mum was 2 and she was raised by her fatherâs sisterâs McIntyre family. Thanks Noni. i’ll have a look.I’ve a few medical issues cramping my style at the moment. Thanks Shirley. I might have done that myself.